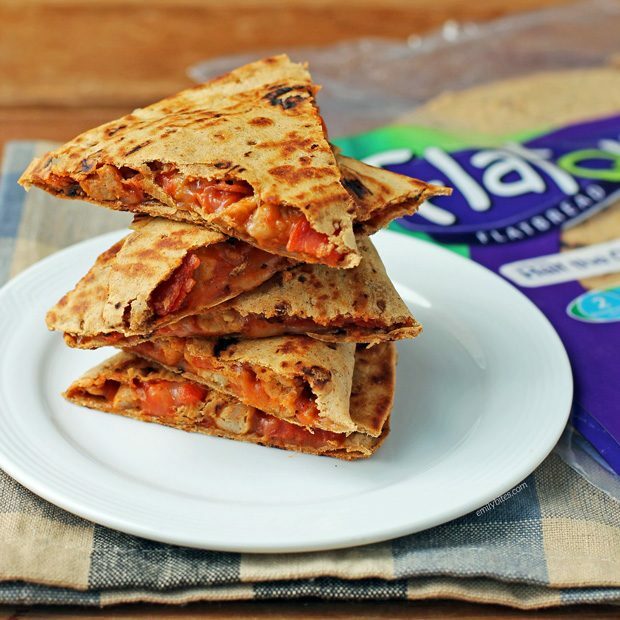 I have partnered with Flatout to create these Pepperoni and Sausage Pizzadillas. I have been compensated for my time commitment to work with their product, however my opinions are entirely my own and I have not been paid to publish positive comments. These easy, 5-ingredient Pepperoni and Sausage Pizzadillas combine two comfort food favorites in one! This pizza-quesadilla combo is packed full of meaty, cheesy, saucy goodness in a crispy Flatout flatbread for maximum flavor with minimum prep time. 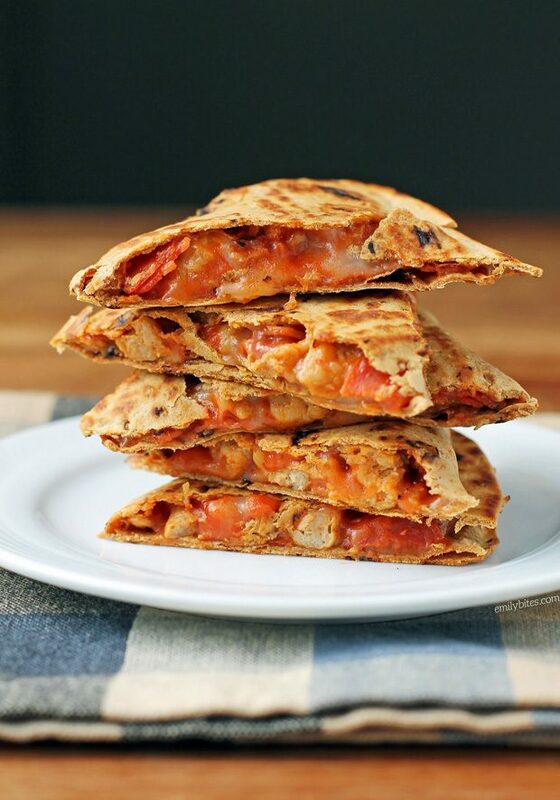 These pizzadillas make a great lunch or dinner and each one is just 310 calories or 7 Weight Watchers SmartPoints with 32 grams of protein and 10 grams of fiber! Not only are these Pizzadillas simple to make but they are also easy to customize with your favorite pizza fillings and toppings. I love them as-is but you can definitely add mushrooms, pineapple, peppers or whatever other pizza favors you love. Many of you already know about my love for Flatout flatbreads (I know, I talk about them all the time – can’t help it). They’re tasty, versatile, full of protein and fiber and now endorsed by Weight Watchers® – what’s not to love? I always have some in my pantry because they make quick and easy pizzas, wraps, quesadillas, pinwheels, sandwiches and more. Perfect for planning to use in a healthy recipe or for dinner on the fly with whatever is in your fridge. Looking for more recipe ideas using Flatout flatbreads? Check out my Easy Chicken Quesadillas, Taco Flatbreads, Barbecue Chicken Bacon Wraps, Buffalo Chicken Tacos, Strawberry Avocado Toast Flats, Greek Chicken Tacos, Fruit Pizza Flats, BLT Flatbreads, Savory Sausage Pumpkin Flatbreads, Chicken Caesar Wraps, Veggie Lover’s Flatbread, Black and Blue Steak Wraps, Easy Taco Cups, Spicy Southwest Chicken Wraps, Peaches and Cream Dessert Flats, Three Cheese Mushroom Flatbreads, Maple Bacon Breakfast Wraps, Chicken Saltimbocca Sandwiches, Buffalo Chicken Pinwheel Wraps, Spinach Artichoke Flatbreads, Greek Snack Flats, Mexi Burgers with Guacamole, Chinese Chicken Wrap, Chicken Pesto Flatbreads and Bacon Cheeseburger Wraps! Bring a large skillet to medium-high heat and add the sausage. Use a wooden spoon or spatula to break up the sausage while it cooks until cooked through and in small bite-sized pieces. really thank you so much friends, I’m tired just to find this, and this is very useful for me. I just made these, they came out great! I did not have Flatouts in my grocery store but I just made it with 3pt sandwich thins and put them in the toaster first so that I so it would not get soggy. Thanks so much for the great recipe, Emily! It looks great. I was wondering if I could use regular tortillas for this instead of the flatbread. I have some fully-cooked poultry sausage in the right amount. I’m thinking of warming and slicing them, then proceeding with the recipe. Do you think that will work?